The small decline in output is likely influenced by the additional week day in June 2017, and on a like-for-like basis, production would still have been higher. Nonetheless, supplies in recent months have been tighter than earlier in the year. Production was less than 1% above year earlier levels across May-June, compared to a 6% growth in the first four months of the year. 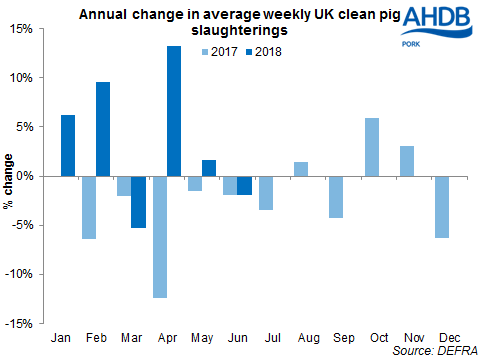 The modest decline in absolute production during June was driven by a 2% drop in clean pig slaughterings, which totalled 831,700 head. England and Wales recorded the largest decrease (-3%, -22,000 head), while throughputs in both Scotland and Northern Ireland were actually up slightly when compared with June 2017, by 9% (+2,000 head) and 2% (+3,000 head) respectively. Clean pig carcase weights averaged 82.6kg during June. This was slightly higher than the previous month and 800g up on a year earlier, somewhat mitigating the impact of lower throughputs. Sow slaughterings were also 3% lower year-on-year at 20,900 head, which will have contributed to the drop in output. This is the first time monthly sow slaughterings have fallen on the year in 2018. The change in trend may simply reflect the return to more normal culling levels from mid-2017, having been low at the start of the year, as well as the influence of an additional working day in June 2017. However, this is still the lowest monthly sow throughput since December.